1. First things first, preheat your oven to 230°C (210°C fan forced). While you wait, place your mini truss tomatoes into a baking dish and lightly coat with olive oil and a pinch of salt and pepper. Once your oven has reached temperature place your hash browns on a separate tray on the top shelf and your tomatoes on the bottom shelf. Keep a close eye on them for 5-10 minutes or until the hash browns are golden and the tomatoes have blistered. 2. You can easily buy hollandaise pre-made; however if you prefer to make your own it’s simple. Beat the egg yolks and lemon juice together in a microwave-safe bowl until smooth. Slowly stream melted butter into the egg yolk mixture while whisking to incorporate. Heat in the microwave for 10-15 seconds then whisk again. Season to taste. 3. Fry the bacon to your liking and set aside on a paper towel. If you prefer sautéed spinach to fresh, simply add a touch of oil to a pan and heat until wilted. 4. 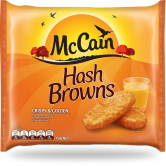 To build your delicious stack, place your golden McCain Hash Browns on a plate followed by a rasher of bacon, layered with spinach, topped with your tomatoes and of course finished with your smooth hollandaise sauce. Enjoy! 1 First things first, preheat your oven to 230°C (210°C fan forced). While you wait, place your mini truss tomatoes into a baking dish and lightly coat with olive oil and a pinch of salt and pepper. Once your oven has reached temperature place your hash browns on a separate tray on the top shelf and your tomatoes on the bottom shelf. Keep a close eye on them for 5-10 minutes or until the hash browns are golden and the tomatoes have blistered. 2 You can easily buy hollandaise pre-made; however if you prefer to make your own it’s simple. Beat the egg yolks and lemon juice together in a microwave-safe bowl until smooth. Slowly stream melted butter into the egg yolk mixture while whisking to incorporate. Heat in the microwave for 10-15 seconds then whisk again. Season to taste. 3 Fry the bacon to your liking and set aside on a paper towel. If you prefer sautéed spinach to fresh, simply add a touch of oil to a pan and heat until wilted. 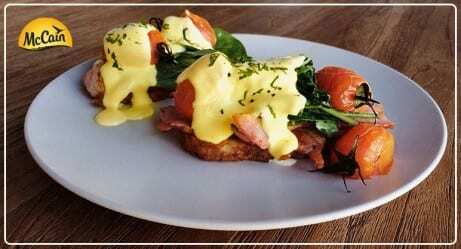 4 To build your delicious stack, place your golden McCain Hash Browns on a plate followed by a rasher of bacon, layered with spinach, topped with your tomatoes and of course finished with your smooth hollandaise sauce. Enjoy!